Lev Oborin (piano); David Oistrakh (violin); Sviatoslav Knushevitsky (cello). 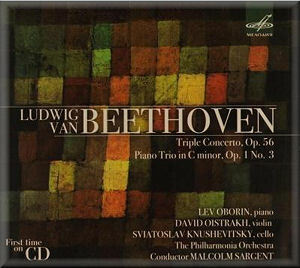 These are justly famous performances but the sound of the "Triple Concerto" is appreciably worse than the 1990 stereo re-mastering on my old bargain EMI Laser issue; it is in thin mono which manages to sound both muddy and clangourous - and as such not worth the investment in this Melodiya re-issue. Nor is the Trio really "First time on CD" as the cover claims; it has long been available on the Brilliant label's super-bargain 10 CD set of the Oistrakh Trio Edition. Of course the performances themselves are peerless; refined but alert with just the sense of delight in music-making these pieces demand. However, I can see no point in recommending this version when the recorded sound is so unnecessarily disappointing. I wonder why Melodiya went to the trouble of issuing these performances in such an attractive format with artwork by Klee and a retro-design CD made to look like an LP when they are so poorly engineered.